Mum of Five Staying Sane: An open letter to Mr/Mrs Hotpoint, Indesit, must try harder. By the time my tumble dryer is fixed my toddler will have moved out! An open letter to Mr/Mrs Hotpoint, Indesit, must try harder. By the time my tumble dryer is fixed my toddler will have moved out! Having registered my tumble dryer for repair back in November, I'm still waiting. As are hundreds of thousands of other people. Some have had their homes ruined by your machines because you haven't fix the issue quick enough but don't worry, you carry on sitting on your millions of pounds worth of cash. Maybe all that cash bought you a Bosch dryer for your ivory tower because I can guess you don't have one of your dangerous machines in your home and if you do I am 100% certain yours has been fixed already. Let me take you back to November when I registered my dryer for fixing. An email dropped into my inbox saying you would be in contact asap and I could carry on using my dryer as usual. This being multiple times a day as its Winter and I have seven people's washing to dry. It informed me that I couldn't leave my appliance unattended. 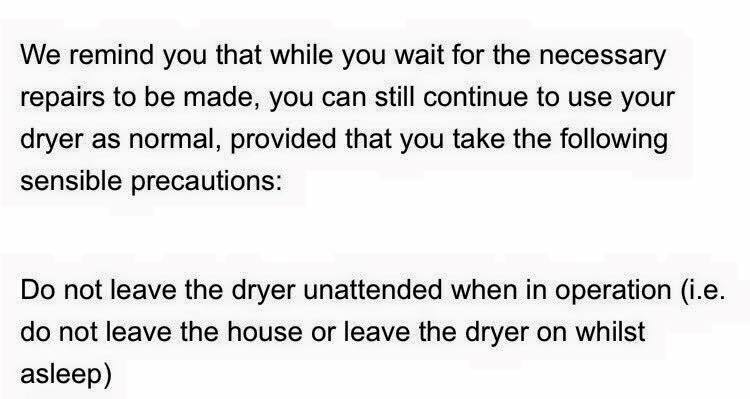 Two separate emails telling me I COULD continue to use my dryer but to take precautions. I love watching my tumble dryer?! So, since November I have spent more time with my tumble dryer than I have with my own family. I've watched it more than my TV, it's quite boring to be fair having only a few programmes, a change in heat setting makes for a more intense viewing. Then back in January I received another email telling me there was a delay but I could get a new tumble dryer if mine was over 1 year old. It gave me 2 options, a condenser or a vented machine. I looked at the vented machine, it was a downgrade in energy efficiency on my machine I had and you expected me to pay towards it. Now Mr Indesit Hotpoint do you really need that £59, I think not. We only got our dryer last year and I'm not paying out more due to your incompetence. So I waited, and waited, and waited. To date I've spent nearly 3 months with my machine. It enjoyed Christmas and celebrated New Year with a day off. My Mum tells me that if you wash clothes on New Years Day you wash a life away. Lucky for my machine I don't take the risk, it appreciated it's day off and it meant I could spend the day with my family, they seem like nice people. My social life has suffered, it's a great new excuse for replying to invites out 'Sorry not tonight I'm watching my tumble dryer'. Now here's my issue. I can't afford to buy a new other branded tumble dryer but if I could I would have bought one straight away and not had to sit staring at a dangerous hazard awaiting a fire in my home. I'm always told you get what you pay for and maybe if I had bought a more expensive higher end brand I wouldn't have wasted my time and money on your brand. If we wait any longer it will be Summer and I can hang some washing on the line, my dryer can have an extended holiday at the local tip and I can rummage down the back of the sofa to see if my pennies stretch to a new dryer for next Winter, not one of yours. Thing 5 helping out by taking a shift for me. So for now I will remain watching my dryer, I have clothes to wash and dry. If only the conversation between me and my machine wasn't so one sided. Maybe one day I can spend more time with my children too although I've spent so long with he tumble dryer it's become one of the family. 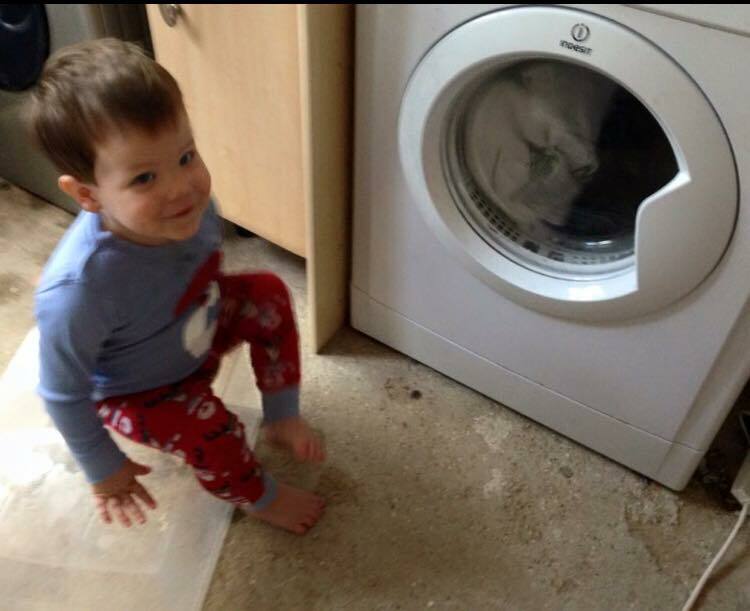 Frustrated Mum of Five and Mr Tumble Dryer. I have had the exact opposite experience to you they were quite quick in contacting me. And like you I was offered the £59 one which I was happy with mine isn't new in fact it 14 years old and probably would have died right after they fixed. I can completely understand why you wouldn't want to pay for new one as it's still well within warranty and it's their fault it has an issue. Ironically I got my one 14 years ago as a replacement for a tumble dryer which caught fire and burnt down my home (no one was hurt) I really hope you get this sorted soon. 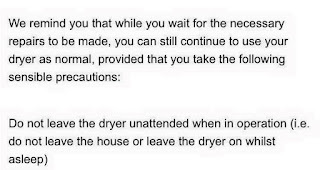 Oh the email I had said they were only offering new dryers if it was over 2 years old. Ours was 6 years old so a £59 dryer, delivered, and the old one taken away was a bargain. Delivery was very efficient too - I didn't have to wait in all day.